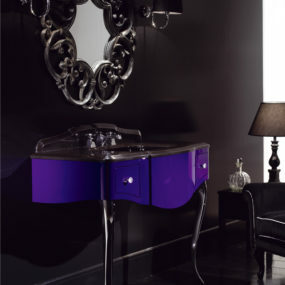 Amp up the style and unique appeal by adding a funky mirror to the powder room. 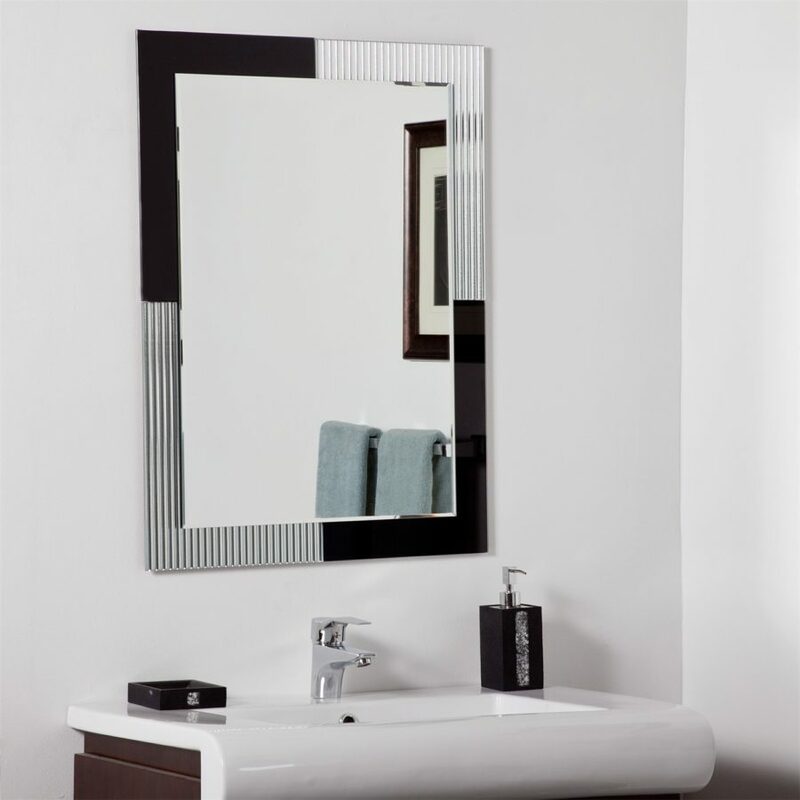 Framed, embellished, or ultra contemporary, brushing your teeth won’t ever be the same. 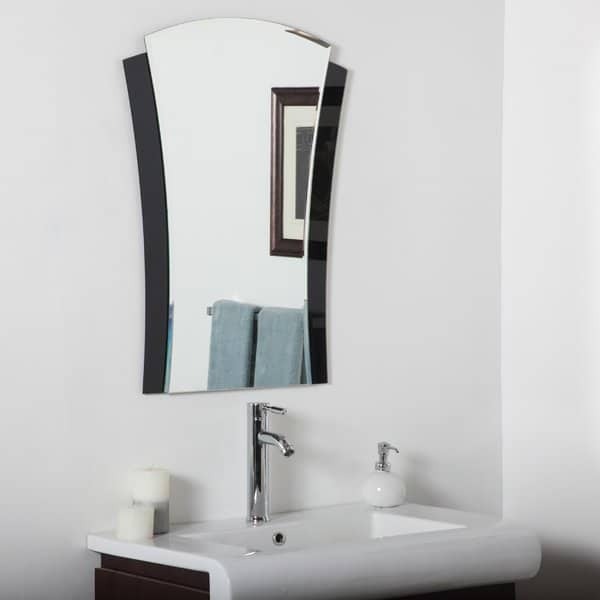 These 15 bathroom mirrors will transform your morning routine just by hanging it up on the wall. Let’s have a look at some of our favorite finds! 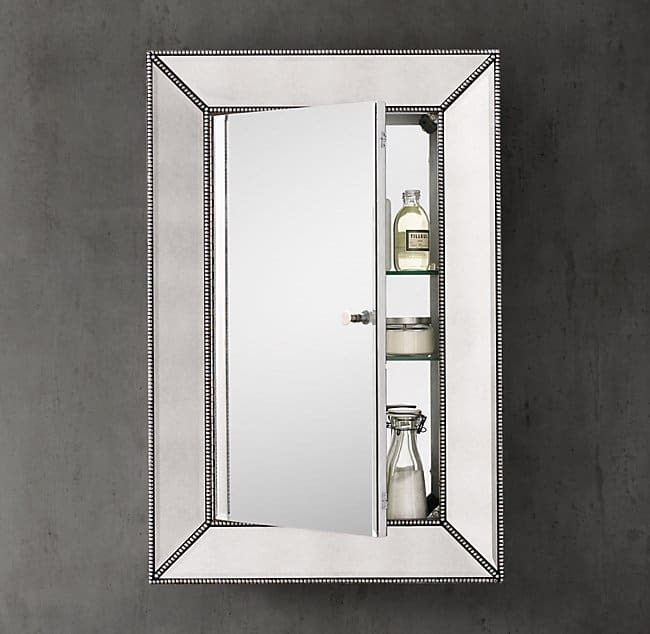 Pottery Barn gives us some classic, medicine cabinet-style bathroom mirrors. 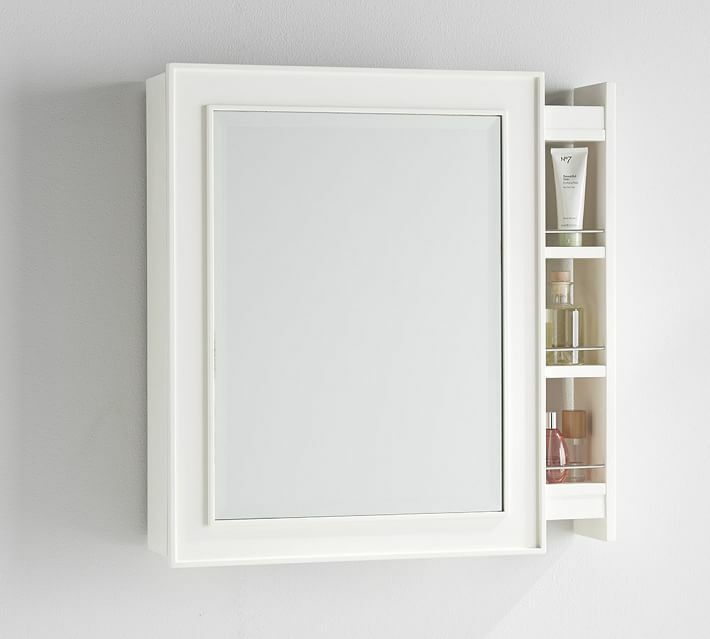 Not only do you get the function of a mirror with this one but you get some storage as well. You can get all of those everyday products off the countertops and placed in the side shelving for easy organization. 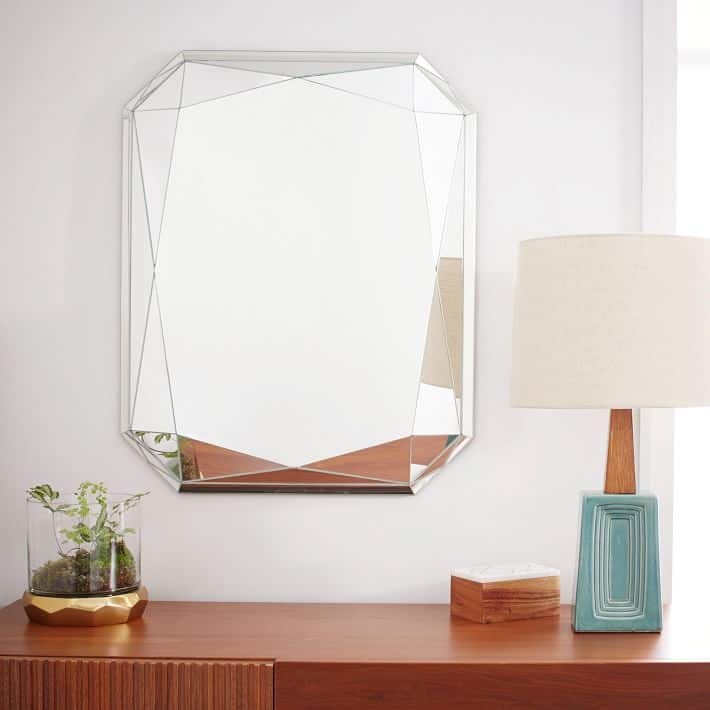 This gorgeous, emerald-cut mirror is from West Elm and it’s an instant heart-stopper. 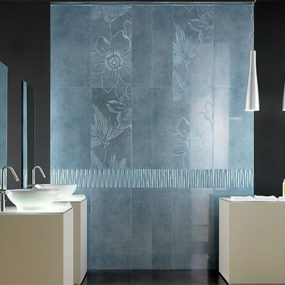 It has a stunning design at first glance but would also help transform your bathroom into something more luxurious. Mornings will become much more bearable if you feel like you’re pampering yourself, don’t you think? The Threshold brand has so much great, affordable, and accessible stuff for so many people. 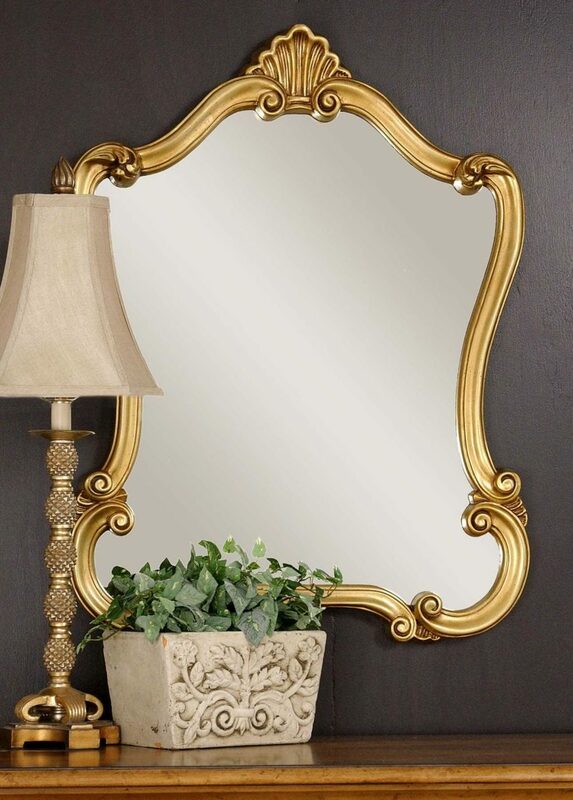 And this gold-finished mirror is one of them. Dress up your bathroom with a pair of these beauties! Visit Target to find some other pieces like this one! If you don’t have as much wall space as you would like, go with a slimmer design. Bed Bath & Beyond carries this James Martin piece in “urban grey” and we’re in love. It fits in nicely with both traditional and more farmhouse-centric styles. Urban Outfitters has a storage mirror that can definitely come in handy as well. 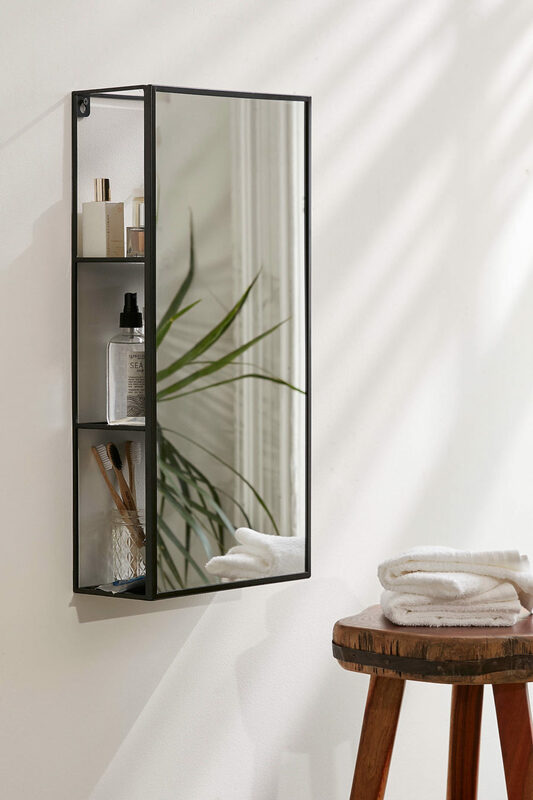 The “Cubiko” storage mirror is everything you need in a bathroom necessity. With shelving space to keep the musts off the counter and a chic design for your modern, trendy vision. This contemporary design can be found hanging out at All Modern. Although its modern in all its shaping, it’s definitely got a fun, 1990’s throwback feel to it as well. 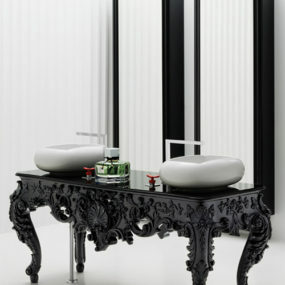 We love its unique shape and the black glass that frames it making it an even edgier piece to display and use. 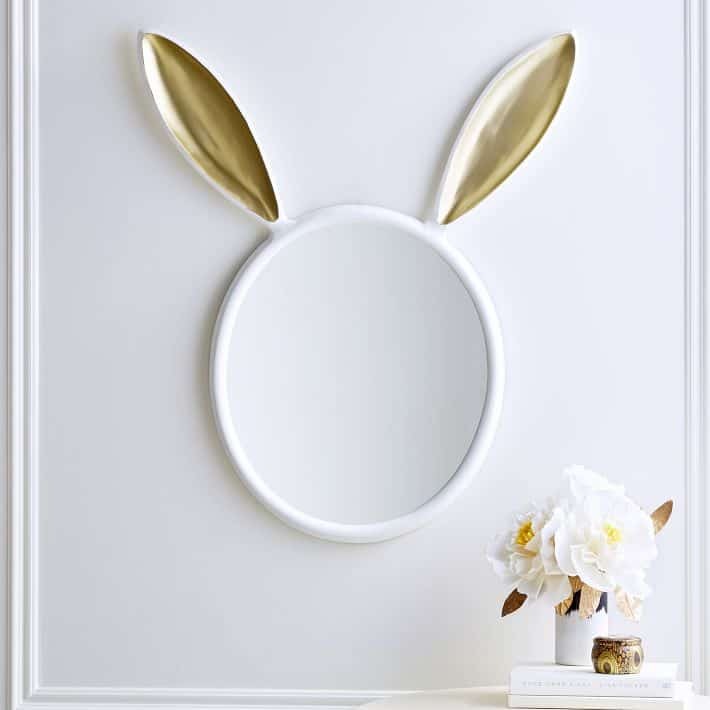 If you’re looking for a piece that makes a real splash, look not further than this charming bunny design from PB Teen. Dress up the kid’s bathroom with something that makes everyone smile. 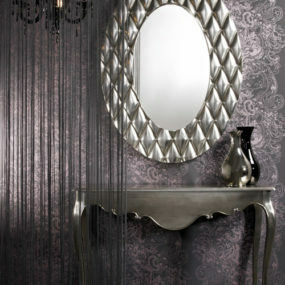 It’s a great find for the guest powder room as well, don’t you think? Walmart has some pretty great finds as well including this “Jasmine” design. 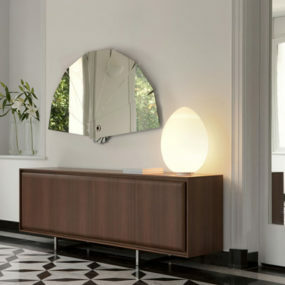 It’s definitely got a contemporary spirit and its a great choice for smaller spaces as well. Note that it’s easily hung either vertically or horizontally. 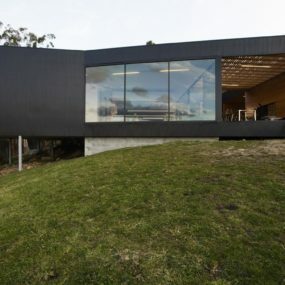 Check out this beauty from RH! 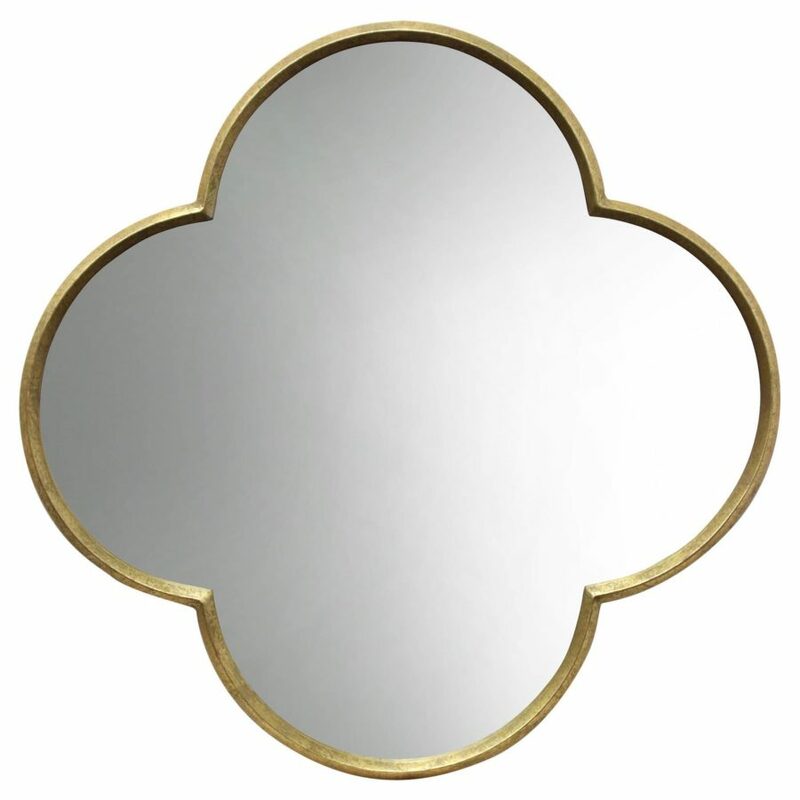 Chic, sleek , and full of elegance, this piece is truly both functional and extra stylish. 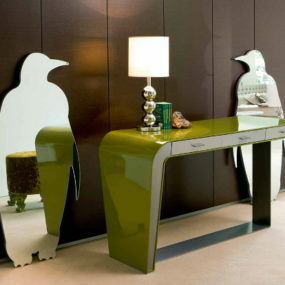 Featuring beveled glass and silver-leaf cast resin beading, it’s one you’ll want to have in your own space. 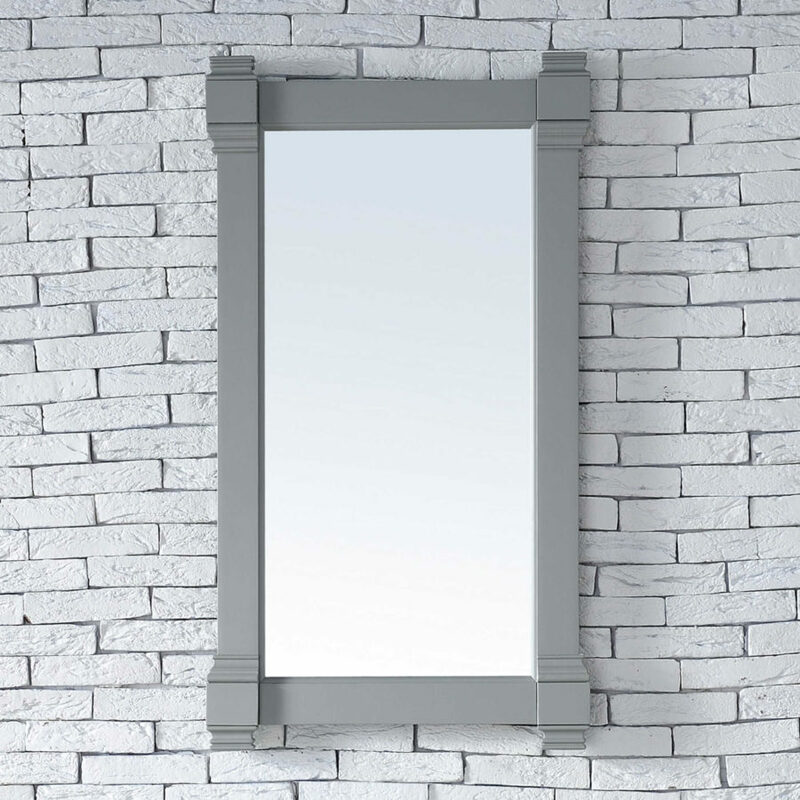 If you love pieces with a bit of a unique, antique style, then this French revival-style mirror from Rejuvenation will be right up your alley. The details are so special, including the tassel accents and gold and olive tones. 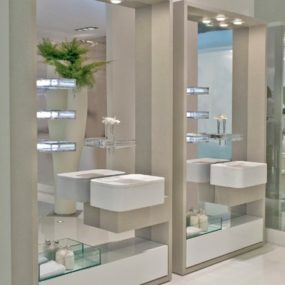 Ballard Designs has a lot of amazing piece but if you’re looking for elegance and simplicity then you’ll definitely want to check out their selection. 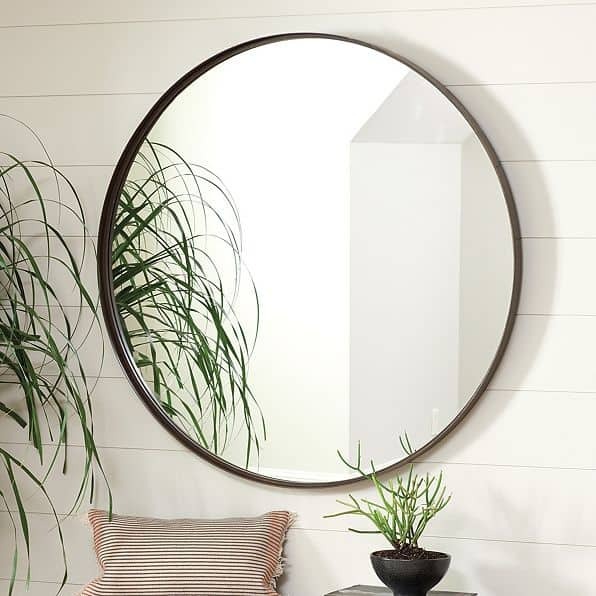 The “Thomas” mirror will work into so many different spaces and homes. It’s one of the most versatile on the list and will need to go in a bathroom that’s more open and with more wall space than the norm. 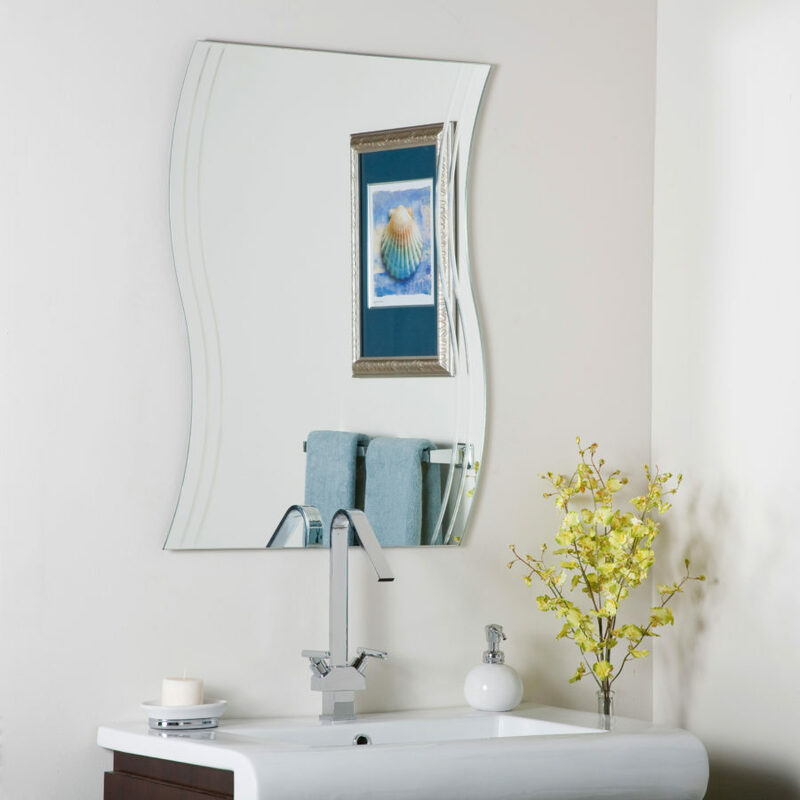 This waved, frameless design from Overstock is another fun piece that works perfectly over the sink in the bathroom – especially smaller spaces. Again, this one has a bit of a retro feel that we really love. It’s still contemporary and clean but we love the extra personality that it will bring to the room. A personal favorite design on the list comes to us from Shades of Light. It’s a bit masculine, it’s a bit industrial, and it’s a lot functional, especially for the bathroom. 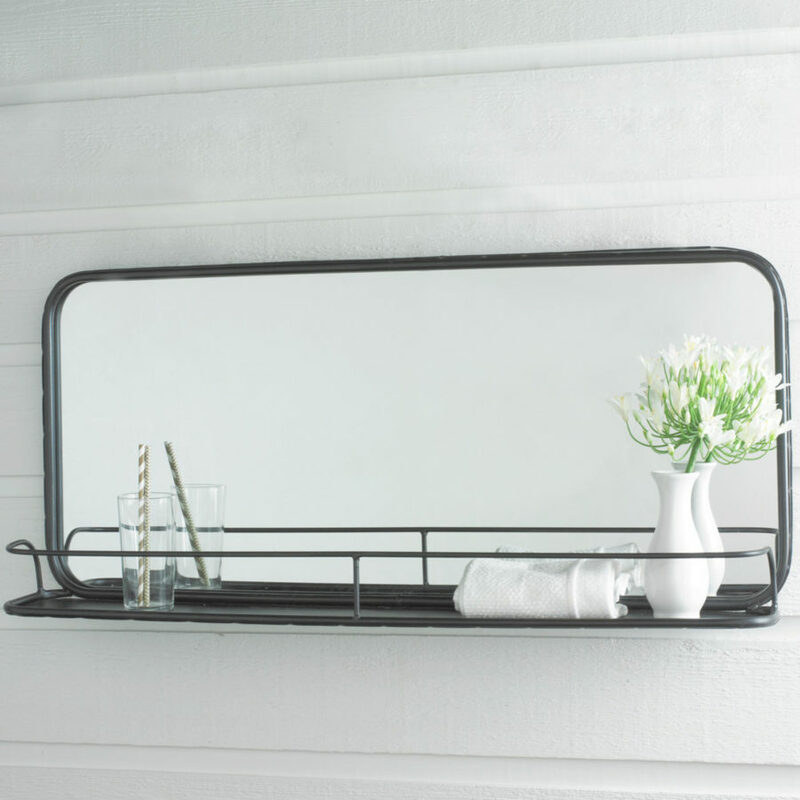 It’s shelf makes easy organization and it’s unusual shape will bring in a lot more style. 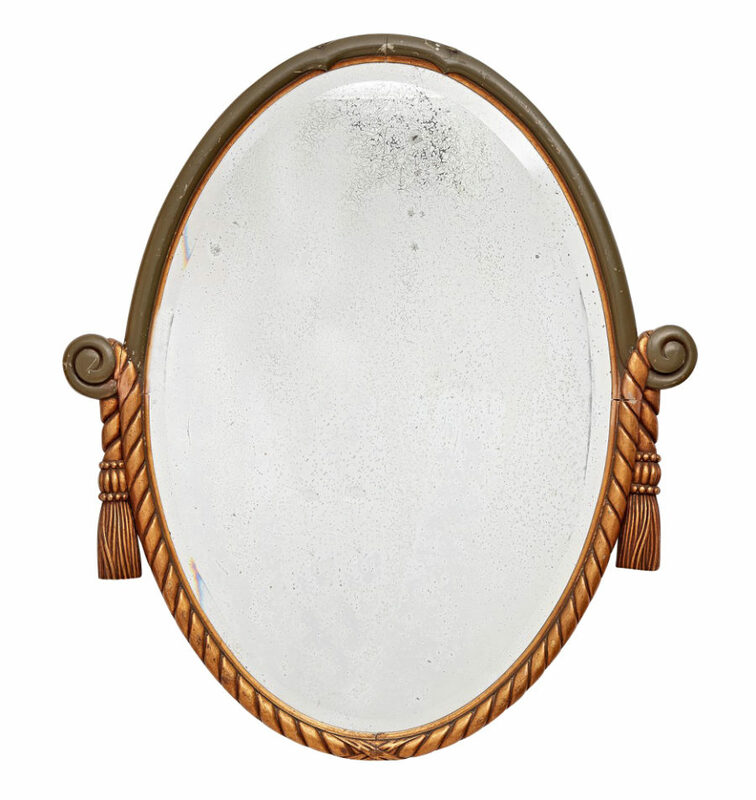 We’re absolutely swooning for the “Walton Hall” mirror from Uttermost. It’s lightly distressed and has some red undertones making it a bit antique in its finish. If you’re looking for a way to dress up your guest bathroom, this is the way to go. 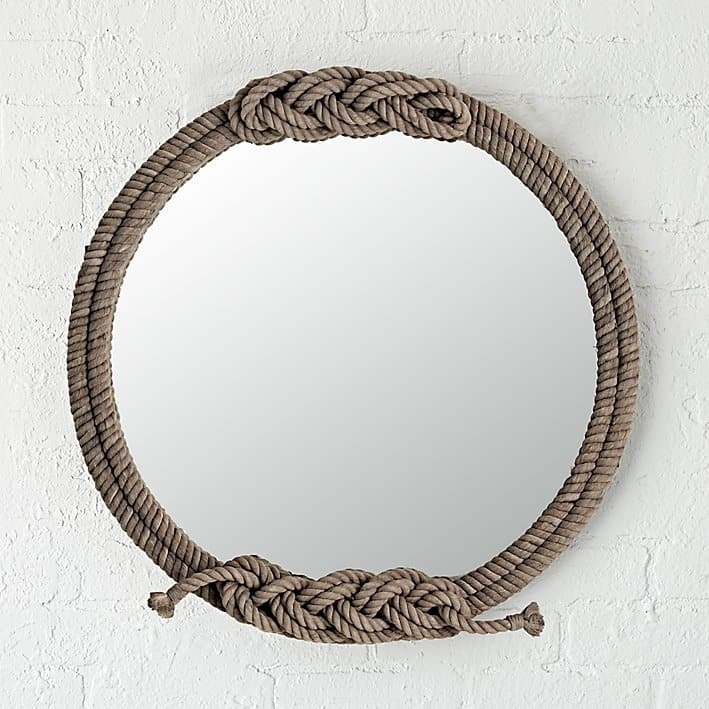 The Land of Nod swept us off our feet with this gorgeous, rope mirror. It’s super easy to hang up and will go with a lot of different designs. – farmhouse, nautical, rustic, eclectic, and more!